A rural Illinois jury has found one of their peers innocent in a marijuana case that would have sent him to prison. Loren Swift (pictured below) was charged with possession of marijuana with intent to deliver, and he faced a mandatory minimum of six years behind bars. According to Dan Churney at MyWebTimes, several jurors were seen shaking Swift's hand after the verdict, a couple of them were talking and laughing with Swift and his lawyer, and one juror slapped Swift on the back. The 59-year-old was arrested after officers from a state "drug task force" found 25 pounds of pot and 50 pounds of growing plants in his home in 2007. The Vietnam veteran walks with a cane, has bad knees and feet and says he uses marijuana to relieve body pain, as well as to help cope with post traumatic stress. This jury exercised their right of jury nullification. Judges and prosecutors never tell you this, but when you serve on a jury, it's not just the defendant on trial. It's the law as well. If you don't like the law and think applying it in this particular case would be unjust, then you don't have to find the defendant guilty, even if the evidence clearly indicates guilt. In jury nullification, a jury in a criminal case effectively nullifies a law by acquitting a defendant regardless of the weight of evidence against him or her. There is intense pressure within the legal system to keep this power under wraps. But the fact of the matter is that when laws are deemed unjust, there is the right of the jury not to convict. 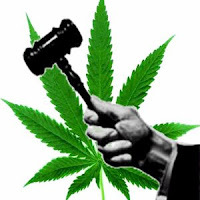 Jury nullification is crucially important because until our national politicians show some backbone on the issue of marijuana law reform, it's one of the only ways to avoid imposing hideously cruel "mandatory minimum" penalties on marijuana users who don't deserve to go to prison. Prosecuting and jailing people for marijuana wastes valuable resources, including court and police time and tax dollars. Hundreds of thousands of otherwise productive, law-abiding people have been deprived of their freedom, their families, their homes and their jobs. Let's save the jails for real criminals, not pot smokers. The American public is very near the tipping point where a majority no longer believes the official line coming from Drug Warrior politicians and their friends at the ONDCP, gung-ho narcotics officers protecting their profitable turf, and sensationalistic, scare-mongering news stories used to boost ratings. They are starting to see through the widening cracks in the wall of denial when it comes to marijuana's salutary medical effects on a host of illnesses and its palliative effects for the terminally ill and permanently disabled. People are coming to realize that not only have they been sold a lie when it comes to marijuana--they've been sold a particularly cruel lie, a self-perpetuating falsehood of epic proportions that has controlled U.S. public policy towards the weed for 70 years now. The extreme cruelty of the lies told about marijuana by drug warriors is in the effects this culture of fear and intolerance has in the real world--effects like long prison sentences for gentle people who are productive and caring members of society. Because citizens are coming to this long-delayed realization, we are going to be seeing more and more cases like this where juries have chosen not to punish people for pot. As this consciousness permeates all levels of society, it is going to get harder and harder for prosecutors to get guilty verdicts in marijuana cases--and that's a good thing. Maybe this is how the war on marijuana ends... Not with a bang, but a whimper, as cousin T.S. would say. If you ever serve on a jury where the defendant is accused of a marijuana crime, don't forget about jury nullification. Tell the other jurors you don't have to convict, even if all the evidence points to guilt, if you don't agree with the application of the law in this instance. And if you can't swing your peers to your way of thinking, at least you can cause the jury to return a hung verdict.